3PAR writes to SSD’s in 16K pages, with compression of course you end up with odd sized pages. These sub 16K sized pages are not optimal for writing to SSD and would incur a post process garbage collection to neaten things up and optimise their layout. To eliminate this need for the additional garbage collection over head the odd sized pages are stitched together, just like your Nan makes a jumper, to form neat 16K pages. This process of taking odd sized compressed pages and packing them together is shown below. Dedupe gets a code update in 3PAR OS 3.3.1. This new update changes the way dedupe operates writing to a private area first, as opposed to a shared area previously. This change in operation aims to make the process more efficient, reducing garbage collection and ultimately making the system more scalable. TDVV (Thin Deduplicated Virtual Volumes) are depreciated, now you just create a standard volume and just change the attribute for the volume to turn on dedupe. Setting the dedupe attribute can be done from the CLI or SSMC. Dedupe and compression can be combined together and HPE are expecting a median 4:1 data reduction, when the technologies are combined. The good news is that dedupe is again licence free and can be applied to all the GEN4 (7000 + 10,000) and GEN5 (8000 + 20,000) systems. 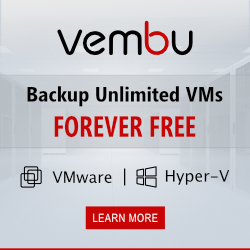 I really like the idea of VVOLs and have covered them in depth previously. Their take up has been a little slower than I would have expected and one of the main reasons I have seen cited was the lack of replication support. vSphere 6.5 introduced VVOL replication and 3PAR now supports this functionality once upgraded to 3PAR OS 3.3.1. Don’t forget given the granular nature of VVOLs this will mean that replication can be controlled at a per VM level. Peer Persistence has to be one of my favourite 3PAR features, this enables the creation of a metro cluster or stretched cluster if you like across data centres. This high availability setup allows storage to be switched between data centres, online with no disruption to hosts. Peer Persistence 3DC allows a 3rd leg to be added to the replication topology. This 3rd location does not become part of the metro cluster but allows a 3rd copy of the data to be replicated asynchronously for data availability. 3PAR must have more native software allowing data services than any other SAN now. Deciding which ones you wanted and then having to pay for them was painful. Well now all licences within a single system are free! If you have more than one system and are using features that allow the systems to talk to each other e.g. Remote Copy, Peer Persistence, Peer Motion you will need to upgrade to the multi-site licence. Again once you have the site licence this enables all multi system functionality. I have been wondering for a while if and when they were going to enable replication between the StoreVirtual and 3PAR, well it is now possible with the use of RMC in a feature called Peer Copy. RMC is now included in the free licence bundle and in this circumstance acts as the data mover, replicating crash consistent snapshots between a 3PAR and Store Virtual. Other RMC enhancements include replication to Azure, deployment in Hyper-V and SAP HANA support. File persona gets a bunch of feature additions including doubling scalability, file locks for governance, cross protocol file sharing and a file system checker. The existing warranty on 3PAR SSD’s is 5 years, now this has been extended to 7 years. This covers media wear out and electronics. The offer is open to all SSD’s in 8000 and 20,000 systems bought after June 2015. There are even more enhancements than this but I don’t want this blog turning into a hardback edition so I will bring more news in the coming days on other enhancements and deep dives on what has been discussed today. To make sure that you don’t miss any updates, you can get e-mail updates, or follow via Face Book, LinkedIN and Twitter. This is a mind blowing amount of information and if your head is spinning check out these nice videos in which Calvin Zito summarises these announcements in two videos Video 1, Video 2. Today was just the announcement of the new release, the GA date is not today. Thanks for reading and the kind comments! You said “The existing warranty on 3PAR SSD’s is 5 years”. I think it depends on model of SSD. Valuable information and well explained. Thanks for that. Is replication support available ( other than VSA) for any other 3 party solution? e.g. also file based to a SMB volume / Windows file share. is the dedupe feature applicable only to SSDs or also do FC disks?